All PNTL voyages are conducted in full compliance with international laws and the ships carry all the necessary certificates and documentation to demonstrate their compliance with international regulations. Each PNTL ship is certified as an INF3 class vessel under the International Maritime Organization’s (IMO) Code for the Safe Carriage of Irradiated Nuclear Fuel, Plutonium and High Level Wastes in Flasks On Board Ships (INF Code). This Code establishes standards for the design of ships carrying nuclear cargo according to the type of material being transported. INF3 vessels can carry used fuel, high-level waste and plutonium with no restriction on the aggregate radioactivity of the material on board. The original PNTL ship design formed the basis of the INF Code that was first introduced by the IMO in 1993 and became mandatory in January 2001. PNTL operated to the INF standards twenty years before they were introduced as a requirement. The special packages – called “casks” or “flasks” – in which used fuel, vitrified high-level waste and MOX fuel is transported on PNTL ships, comply with safety standards established by the International Atomic Energy Agency (IAEA). These standards are enforced by national regulators in all the countries PNTL travels to and from. The casks carried by PNTL are classified as “Type B”, which means they are designed to withstand severe accident conditions and can hold material to defined levels of radioactivity. 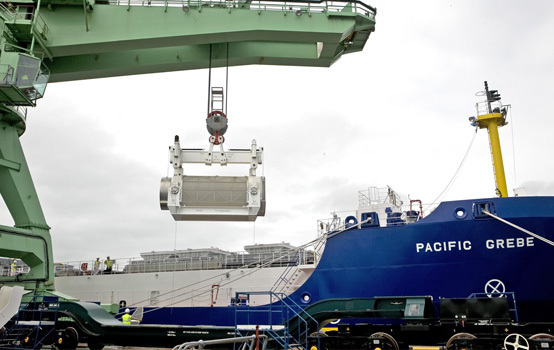 The special packages – called “casks” or “flasks” – in which used fuel, vitrified high-level waste and MOX fuel is transported on PNTL ships, comply with safety standards established by the International Atomic Energy Agency (IAEA).